The title is an exaggeration. I was aiming only to be able to tolerate it on this particular Saturday, to be able to drink just half a cup. To truly fit in, I must like coffee. That’s what I believe. Vienna has the coffee houses and a list of famous intellectuals from history who wiled away the hours in these revered shrines to coffee. Whenever I’ve been to café Hawelka and café Central I’ve only ordered water, wine or coke and have felt ashamed to do so, so ashamed that I refused, each time, to order tea, something I thought would be too British a thing to do in such a Viennese institution. And so I started work on my goal, to gradually grow to like coffee. I was in café Hawelka, awaiting my order of a Melange, a frothy coffee not too dissimilar to a cappuccino. I also ordered cake, some Sacher Torte, and I knew it came with water, both of which were to aid in the consumption and be my reward. It looked nice when it came, perfect almost. It was topped with a comforting layer of foam, perfectly creamy against the mellow brown coffee. My disappointment was as intense and dank as the taste. The sensation was not mellow, but an attack on my mouth. The taste of dirt sank instantly into the middle of my tongue and remained for the longest time. I felt it as something solid in my mouth. I looked into the cup and saw evil in the murky puddle, like it had been decanted from a cauldron. I asked my husband if he really did like it and when he said he loved it, I wondered why anyone would. I began to feel quite unwell, like a teenager does after the first illegal drag on a dirty little cigarette. And like nicotine stains the fingers, I thought the coffee would stain my tongue and turn my insides mucky. I added a sugar cube and stirred it till it drowned. It fooled my lips for only a second until the nausea started again. I added another sugar and stirred the mud. I took a sip of water, but just as drinking water as an antidote to spice only intensifies the burn; it only deepened the pollution. Then everything started to bother me. The tables looked like they’d been brushed with wire and had coffee worked into the marble. The ceilings looked like they’d been smeared with coffee paste. I felt coffee steam on my face, the reek of it in my hair and on my clothes. I felt everything and everyone was stained with coffee. I stopped drinking and ate the chocolate cake, hoping it would restore me. It was a disaster. But I will not rest. I still believe I must learn to like coffee. 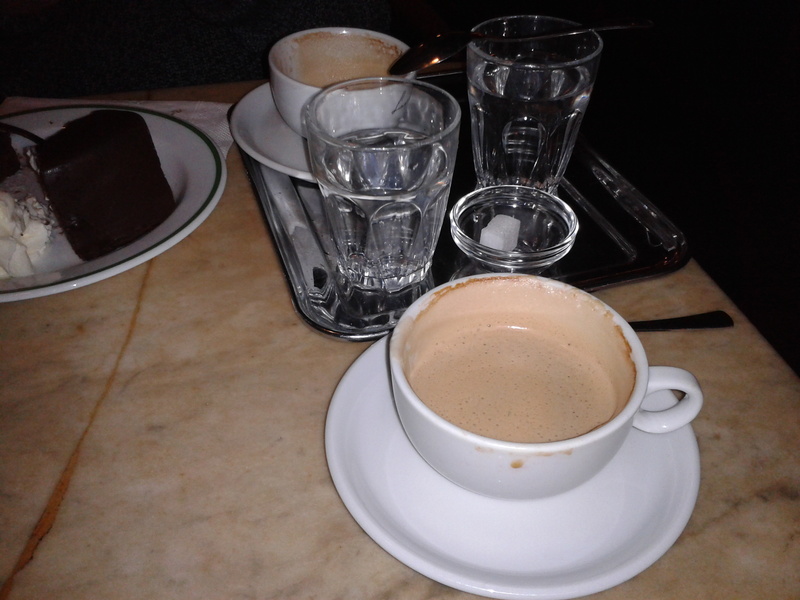 As we took our leave, the waiter wished us a pleasant holiday in Vienna and he was quite right to do so: when it comes to coffee, I am a total tourist.